When our future descendants, armed with the ability to zoom around our Galaxy, are deciding which stellar systems to explore for alien worlds, they may want to pass over the nearby Barnard’s Star. The cool M-class dwarf, first discovered by E.E. Barnard in 1916, lies a mere six light years from Earth, making it the fourth closest star in the sky. It may also be the home of a controversial planetary system, first claimed by Peter van de Kamp in the 1960s. Several independent studies have failed to reproduce van de Kamp’s results, and the existence of the planets still remains disputed. The authors of this work report the most precise radial velocity measurements of Barnard’s Star to date, with data spanning 25 years. They find no evidence for planets, essentially ruling out the presence of van de Kamp’s claimed system. Previous searches for planets around Barnard’s Star, including van de Kamp’s, have used measurements of the position of the star on the sky as a function of time, looking for wobbles in its trajectory due to the gravitational tug of planets. 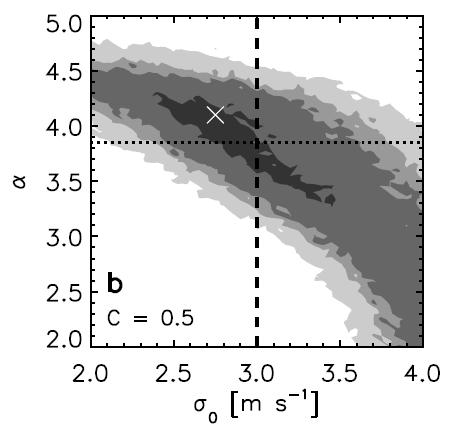 The authors of this analysis use extremely precise data of the star’s radial velocity (the speed of the star towards or away from us) to look for planets, a technique known as Doppler spectroscopy. A planet in orbit around a star will cause that star to wobble slightly as both objects orbit around the system’s common center of mass. As the star wobbles, its emission is periodically blueshifted and redshifted, depending on whether it is moving towards or away from us. These alternating shifts can be detected here on Earth, and the presence of a planet is thus inferred. The final published results of van de Kamp claim the existence of two planets in circular orbits around Barnard’s Star, one with a mass 0.7 MJupiter and 12-year period and one with a mass 0.5 MJupiter and 20-year period. Not only do the authors find no evidence for van de Kamp’s planets, but they also see no detectable planetary signals at all. 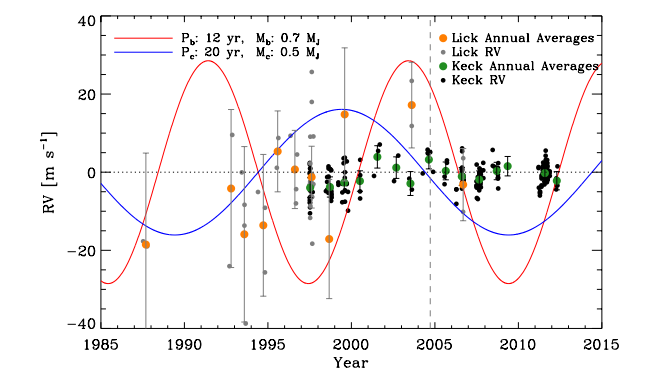 The radial velocity measurements, taken over a 25 year span with the Lick and Keck telescopes, are shown in the figure below. The predicted signals from van de Kamp’s planets are also shown in this figure, and it is clear that the existence of these planets is definitively ruled out, as their amplitudes are significantly larger than what is observed in the data. It is conceivable that planets do still exist around Barnard’s Star, with signals too small to detect in this data set. The authors are able to use their non-detection to place strong upper limits on the masses of any planets that might exist around Barnard’s Star. For planets with periods under 10 days, any planet with a mass greater than two Earth masses would have been detected. For periods under 100 days and under two years, planets with masses over 3 and 10 Earth masses, respectively, would have been discovered in the data, but none were seen. The authors estimate that planets with orbital periods of 10 to 30 days lie in the habitable zone of Barnard’s Star. Thus, an Earth-massed planet in the habitable zone is still consistent with these upper limits. The results of this analysis are interesting for a number of reasons. As the Kepler mission continues to find new exoplanets, their results suggest that planets slightly more massive than the Earth are common around M-dwarfs, like Barnard’s Star. Similarly, the High Accuracy Radial Velocity Planet Searcher (HARPS) survey has found numerous planets of a few Earth masses around M-dwarfs. The lack of such planets around Barnard’s Star is not only surprising, but also unlucky. Such a nearby planetary system would be the ideal target for direct imaging followup and possible robotic exploration by the end of the century. Sadly, it appears that the future interstellar explorers of the human race will have to search for aliens elsewhere. I am a 3rd year graduate student at the University of California-Berkeley. My research interests include cosmology, the CMB, and most things extragalactic. I received my bachelor's degree in astrophysical sciences from Princeton University.